TOTAL FLANKER...a rugby blog: WTF? 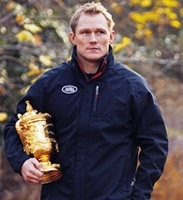 We now know why former England fullback and RWC 2003 winner Josh Lewsey has stepped down from his role as acting chief executive at Cornish Pirates – he is jumping ship and taking up a role as the Welsh Rugby Union’s new Head of Rugby. Lewsey joins the executive board of the WRU and will apparently have operational and strategic control of the whole game in Wales from grassroots to elite level (apart from the senior national squad). His mother may well be Welsh, but that’s no excuse. Lewsey, capped 55 times by England and who completed officer training at the Royal Military Academy in Sandhurst, knows the penalty for desertion. Unless, of course, he's a double agent...?